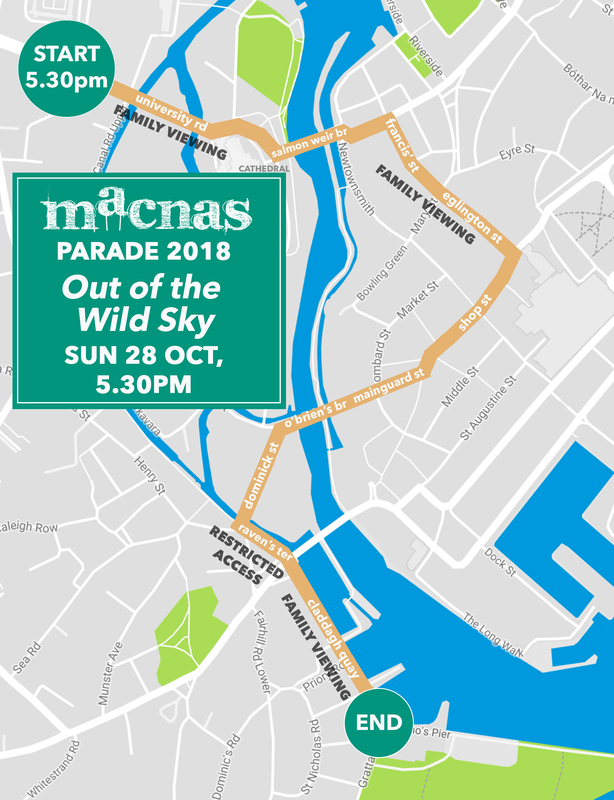 We’re delighted to share the route for the 2018 Macnas Parade in Galway and Dublin. ‘Out of the Wild Sky’ will kick off at 5.30pm on Sunday 28 October. Hundreds of performers will depart from outside the main gates of NUI Galway (no admission to college grounds) and move down University Road, across Salmon Weir Bridge, turning right at the Town Hall Theatre, moving across Francis’ and Eglinton Streets, down Shop Street and into the Latin Quarter, down Mainguard Street and Bridge Street. It will then continue across O’Brien’s Bridge and Dominick Street, before finishing on Claddagh Quay. Recommended family viewing areas allow for a better vantage point for children and easier buggy access. Families can watch in comfort on University Road, along Eglinton Street or near the end of the route as the parade pushes all along the Claddagh Quay. The designated wheelchair/disabled viewing point is at Galway Cathedral. 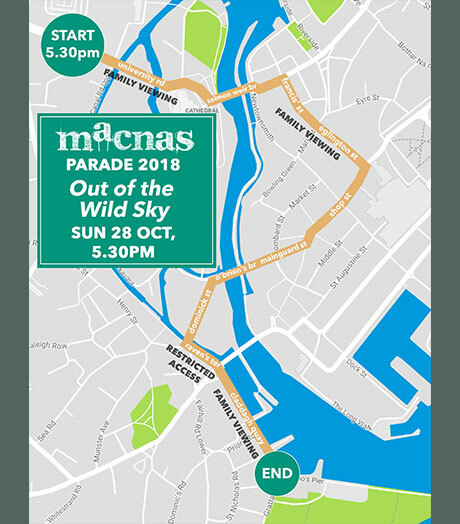 Special thanks to the Galway companies for helping to make this year’s parade possible, Galway City Council, our parade partners The Latin Quarter Galway, Acorn Insurance, Galway Clinic, O’Connells Bar, The Connacht Hotel & Connacht Hospitality Group! View HQ version of map here. The parade starts on Moore St, travelling through Henry St, Mary St, Capel St, Little Britain St, Halston St and ends on Mary’s Lane. Arrive early – there will be big crowds and you’ll want to settle into the right spot before it starts. We suggest finding your spot along the route from 6.30pm. All streets on the route have excellent visibility, but we suggest avoiding junctions & corners, as these bottlenecks tend to be the spots with poorest visibility. We have a dedicated viewing area for people with accessibility requirements or special needs. Space in the dedicated accessibility viewing area is limited and therefore needs to be reserved.